As metal 3D printing reaches the economic tipping point, global logistics providers could offer 3D print farms. To stay abreast of the speed of change, companies must transition away from today’s largely vertical firm-owned assets model to horizontal cross-company production platforms. The emerging platforms found in major value chains fall into one of two categories: informational and physical. Informational platforms promote data sharing and coordination within the supply chain to shape better decisions and insights, including forecasting accuracy, collaboration and risk management. Physical platforms foster the sharing of physical assets through technology to enhance product handling and flow performance at a lower cost. The problem with the traditional model, simply stated, is that it lacks the diversity of perspective and breadth of capabilities to meet the more varied, unpredictable, and intensive expectations now being placed on companies. Further, when companies reach outside their supply chains to secure what they need, the process is often badly encumbered by traditional organizational boundaries. Response time is too slow. They cannot keep pace. 4IR Production Platforms can help companies meet the new demands of the market by blending digital and physical assets, and by bringing together multiple companies and even consumers to enhance performance. Plan: Blue Yonder, a machine learning cloud-based platform for predictive demand forecasting and inventory optimization, offers a flexible pay-as-you-go platform for companies seeking to leverage the power of AI/machine learning. Participating companies provide data for training the underlying algorithms across different product category, country, and channel dynamics. This training data helps fine-tune the underlying AI algorithm, to the benefit of all participants in the network – which includes companies that are in direct competition. Make: Drishti is a company that leverages AI vision-based technology to capture and analyze human activity within factory walls to pinpoint optimization opportunities. As customers like Foxconn, GE or UPS join Drishti’s subscription-based platform, they provide valuable training data and use cases to fine-tune the underlying motion analytics engine, which benefits all participants. Deliver: Flexe offers on-demand warehousing space to businesses in the US. The cloud-based operations management interface allows warehouse owners and companies to list their available capacity on the platform and allow customers (e.g. retailers and brands) to rent their excess warehousing space. This AirBnB approach to securing warehouse space provides a low risk, low cost option for retailers and brands to test new omnichannel delivery concepts, such as same day delivery pilots near critical areas, without building their own dedicated distribution centres. These examples are just a hint of what is to come once companies grasp the performance potential they can tap by engaging in 4IR Production Platforms. For example, as metal 3D printing reaches the economic tipping point, global logistics providers such as DHL or UPS could offer 3D print farms, co-located across their respective delivery hubs, to serve high margin, personalization-based industries, such as the medical and business-to-business aftermarket. Companies that fail to capitalize on such opportunities may soon be hard pressed to compete. From owned assets to orchestration. Manufacturers will differentiate largely by leveraging capability platforms outside the firm to create innovative products and experiences, in contrast to the conventional reliance on owning and efficiently operating large-scale assets. Core skills must migrate from managing large hierarchies to nimble orchestration of smaller footprint firms. From linear flows to value webs. Consumers are not only viewed as the end users of products, but as active participants in the supply chain, from defining product concepts to serving as last-mile delivery couriers. Roles will become increasingly blurred between suppliers, manufacturer, channel partner and consumer. From control tower to towerless. Governance shifts from key performance indicator (KPI)-driven, digital control tower command and control; to decentralized, towerless teams enabling agile decisions and entrepreneurial behaviour. From internal rate of return to venture capital finance. Traditional internal rate of return-based corporate financing gives way to a venture capital approach of investing in stages, giving full consideration to the strategic opportunity cost of not experimenting with new business and operating models. 4IR Production Platforms could easily fall prey to “winner takes all” situations, monopolistic practices, or unethical data use, to name a few potential downfalls. All must be proactively addressed. Three fundamentals should be built in from the start. Trust. Platforms cannot achieve broad-based adoption without inherent trust. A logical place to begin is by inviting potential platform participants to draft a shared, expansive, and legally-enforceable code of conduct. Re-education. 4IR Production Platforms will require many more people with skills and capabilities that blend traditional operations and engineering disciplines with data and computer science, ethnography and humanistic design thinking. Companies and others planning to participate in 4IR Production Platforms must therefore be prepared to make significant investments in building more of the convergent skills and capabilities required for effective cross-disciplinary and cross-company collaboration. Data security. Data has emerged as the most valuable asset in the Fourth Industrial Revolution, yet 4IR Production Platforms intrinsically demand that participants share their data. Clear data sharing rules and cybersecurity criteria must be established at the outset. For executives, the challenge is not predicting the exact type and timing of future 4IR production platforms in their sectors or across supply chain functions. Rather, it is learning how to integrate a platform mindset into their business model and supply chain. As businesses take important steps toward the implementation of 4IR Production Platforms, policymakers can proactively promote their democratization across evolving production ecosystems. 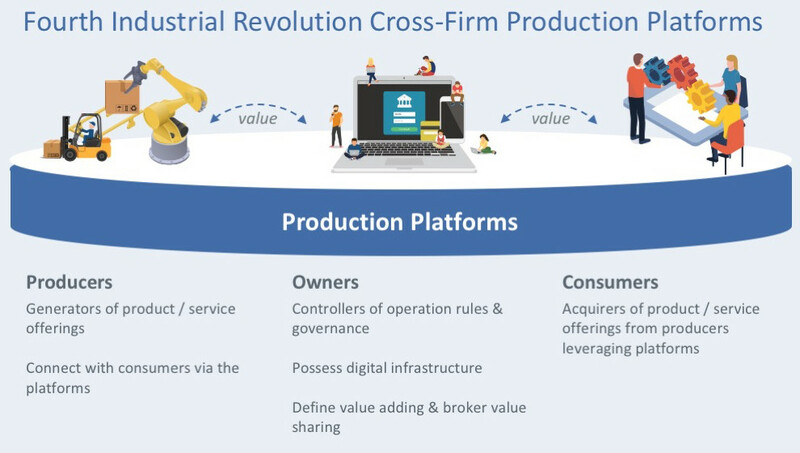 Firm-level actions to implement and scale up cross-company production platforms should, as appropriate, complement country or region-level measures, as 4IR Production Platforms will be an increasingly essential driver of global economic growth.